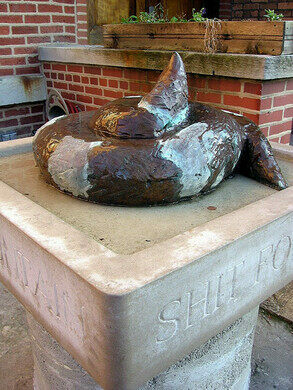 Artist Jerzy S. Kenar installed the public poop as a winking tribute to all of the dogs in the neighborhood who are known to trample and defecate upon his flowers. The metal make sits atop a three-foot sandstone pedestal like a classical Grecian bust and slowly dribbles water into a shallow basin. While the piece may seem disgusting or in poor taste, but it has garnered almost no outcry from the community who seem to truly enjoy the whimsical statement. Technically the statue sits on Kenar’s private property so the city is not concerned either. Surprisingly, Kenar is mainly known as a religious and political artist having designed a number of pieces of church architecture and public pieces such as a tribute to Black History Month. 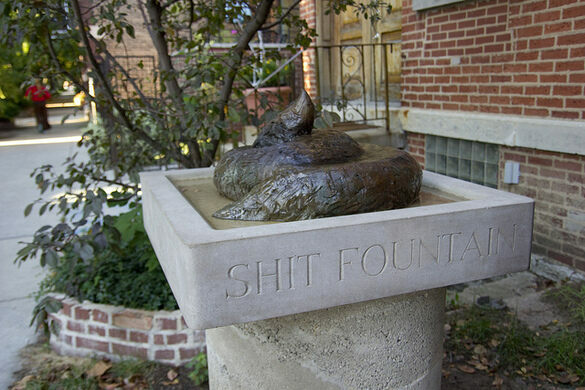 Unsurprisingly, the neighborhood dogs do not know about his larger artistic career, but they undoubtedly know his fountain.